Approximately a year and a half ago, then-Governor General David Johnston convened a first-ever gathering of all Canadian university chancellors. One of the topics of conversation at that meeting: the Truth and Reconciliation Commission, and the responsibilities of universities and of those in leadership positions to help. That call to action built on what Chancellor Leech had been hearing and seeing for himself since he started his three-terms as chancellor in 2014. 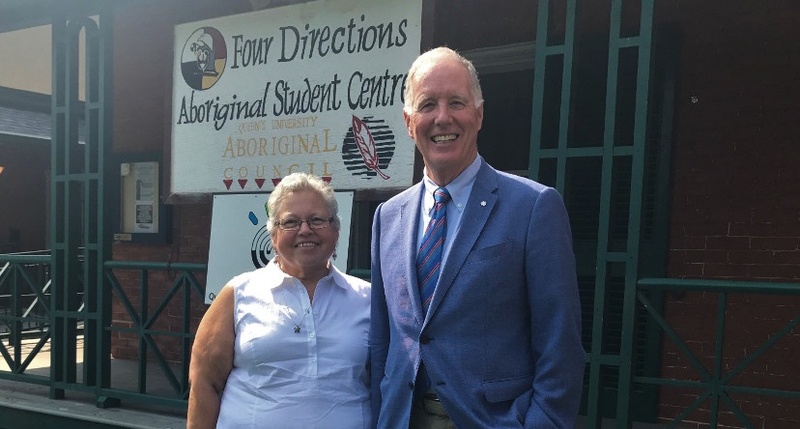 He had participated in a breakfast at the Four Directions Aboriginal Student Centre, attended some of the Truth and Reconciliation Commission Task Force sessions, took part in a blanket exercise with the Aboriginal Council of Queen’s University, and got to know then-Director of Four Directions Janice Hill. Working with Advancement and Four Directions, the chancellor set out to establish a bursary for Indigenous students. The $15,000 need-based bursary aligns with the recommendations of Queen’s University’s Truth and Reconciliation Commission Task Force Report. The bursary is “awarded on the basis of demonstrated financial need to Aboriginal students in any year of any faculty or school at Queen’s University.” Recipients may be full- or part-time students. Your support of this fund will assist Indigenous students in fully participating in the academic and extra-curricular life of the university and will promote inclusion, retention, and success.